Two recent developments celebrate the importance of integrity in the life of our community. The one involves a role model for me as a columnist. The other involves you, our coffee companions. 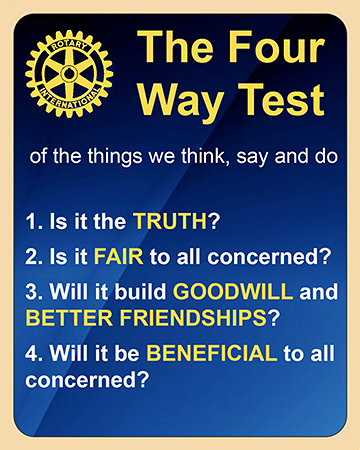 Both developments are informed by what I regard as the four pillars of building bridges of community: Rotary’s Four Way Test. “Integrity” is an interesting word with two overlapping dimensions. On the individual level, it refers to a person’s adherence to high moral principles in word and deed; honesty. On the structural level, it refers to the wholeness made possible by the dependable relationship among the components. From a community perspective, such wholeness is possible only when the individuals within the community themselves have integrity. These four tests are like reliable pillars that support a bridge. Which brings me to the first exciting development. Just this week Cochrane Town Council voted unanimously to name our new bridge across the Bow River at the east end of town, scheduled to open next year, the Jack Tennant Memorial Bridge. The choice of the name honours one of my personal heroes, the founder of the Cochrane Eagle and community builder Jack Tennant. Jack passed away last year, leaving a legacy of bridges of goodwill and better friendships that he’d built up and down our valley, and especially between Cochrane and the Stoney Nakoda First Nation to the west. Mary Anna and I are profoundly grateful for this honour. Yes, these columns strive to be a bridge of understanding and appreciation built on Rotary’s four worthy pillars. But we must stress that our role is merely as storytellers and photo essayists entrusted with your words and wisdom. So, it’s really on behalf of you who have shared so much beauty across the bridge of these columns that we accept the award. And here I must pay special tribute to last year’s recipient, Elder Tina Fox Poucette, of Morley, and retired Judge John Reilly, recipient for 1999, who, like Jack Tennant, have been mentors and models to me of what Rotary’s Four Way Test is truly all about. “Whatever is true, whatever is honorable, whatever is just, whatever is pure, whatever is pleasing, whatever is commendable, if there is any excellence and if there is anything worthy of praise, think about these things” (Philippians 4:8).